Ok. It’s official. Not to be bossy, but I know what you need to make for tonight (Halloween). You need to make a big batch of Sour Green Apple Jalapeno Margaritas or this Sangria and maybe like a double batch of this absolutely out-of-this-W.O.R.L.D. 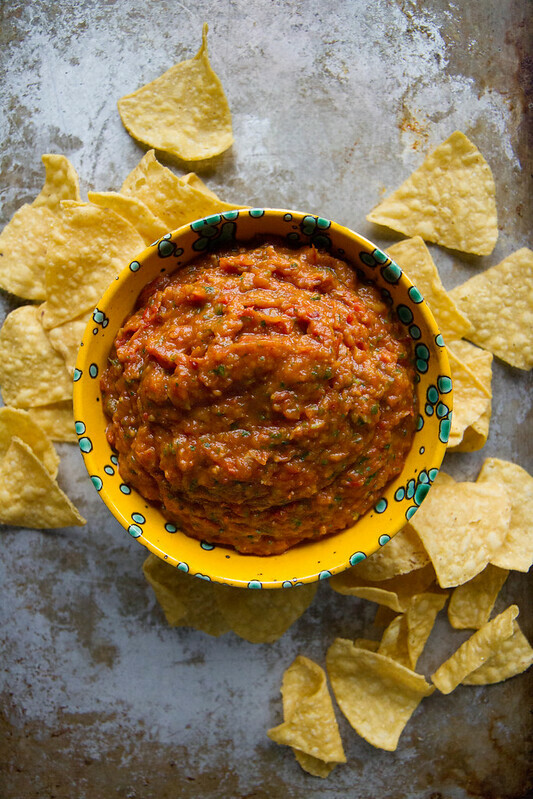 Roasted Butternut Squash Chipotle Salsa. You will also need a bag of tortilla chips, but I assumed that was obvious. 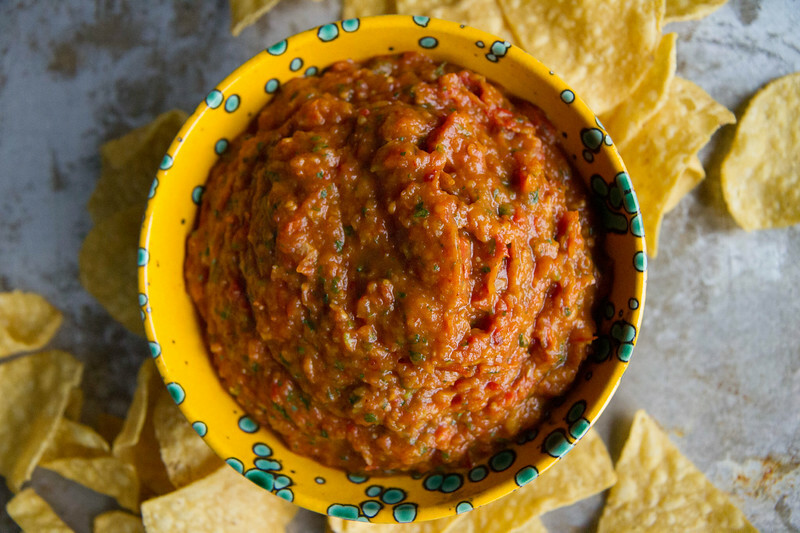 What is not obvious, is to add butternut squash to your salsa. In fact, you probably think I have lost my mind or had too many of the for-mentioned margaritas, but I assure you I have not. This stuff is just seriously, seriously insanely delicious. I’m not sure how to describe it exactly, except for that it is really balanced. The cherry tomatoes and squash give it a very subtle sweetness, the lime some sour and the chipotle and garlic give it smoke and spice and earthiness. I just sounded like a salsa geek, which I suppose I am, but I am ok with that. Can’t you see yourself just sitting back with this whole bowl while you wait for trick-or-treaters!? I think that is what is happening here and I am VERY, very ok with it! Also, please say a little prayer for me that we get some trick-or-treaters this year! Almost no one ever comes here (and we don’t even live on some weird street or anything!!!) and it makes me sad every year. When I finish off my salsa and margaritas I might even have to get off my tush and go out into the neighborhood just to get a good look at all the cute costumes. What are you or your kids dressing up as??? Check Instagram to see our Halloween fun!! Preheat the oven to 400 degrees. On a sheet pan, toss the butternut squash, tomatoes and garlic with the oil. Roast for 30 minutes at 400 degrees. Transfer to the bowl of a food processor and add 1 cup fresh cilantro, the juice of 1 lime and 1-2 tablespoons of chipotle and sauce (depending on how spicy you like it). Pulse until you have a thick salsa and then transfer it to a serving bowl. Serve with tortilla chips and enjoy! On a sheet pan, toss the butternut squash, tomatoes and garlic with the oil and roast for 30 minutes at 400 degrees. This looks delicious! I just made a “fall-ish” salsa with apples. But I didn’t even think of butternut. Genius. Love it! Pinned! I hope you get some trick or treaters. And I hope I do too….or I’m going to be eating a lot of candy by myself! 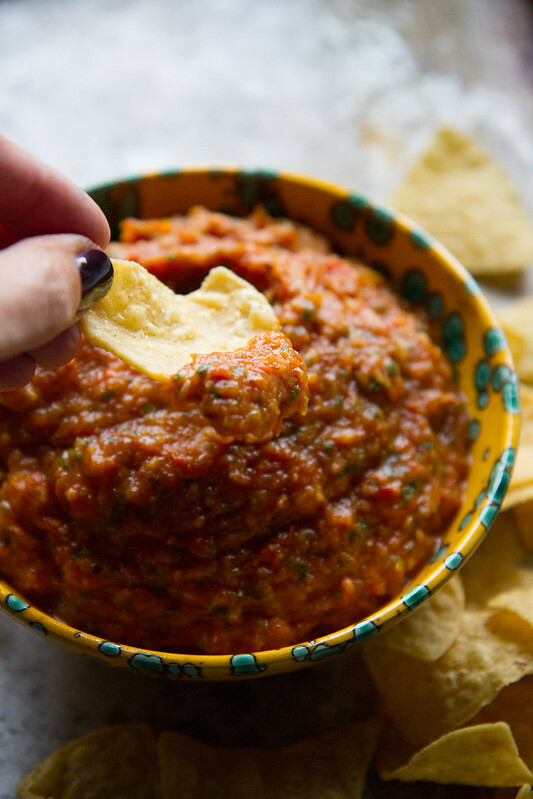 I totally can appreciate your butternut squash addition into this salsa! I just made some salsa with….cauliflower in it. But I didn’t blog about it because, well, you know. I would gobble your salsa right up! With lots of margaritas! 🙂 pinned! What an amazing salsa! I want to dive right in! I love putting salsa on pretty much anything. Plus, homemade is the best! Loving the squash in this Heather! I am convinced that anything squash and chipotle is a winner in my book! Brilliant! I have some roasted acorn and butternut bagged up in the freezer. And cherry tomatoes on the vine that might freeze over the weekend. And a can of chipotle in adobo in the pantry (I just bought this week — wow!). Thanks for the inspiration! Wow, I would never have thought to add squash to salsa! Super interesting, and a great change from the typical squash soup. Yay! Chips, salsa, and margaritas are my Friday night evvvvery Friday night. I wish I was joking 😉 These will be nice to mix it up a bit! 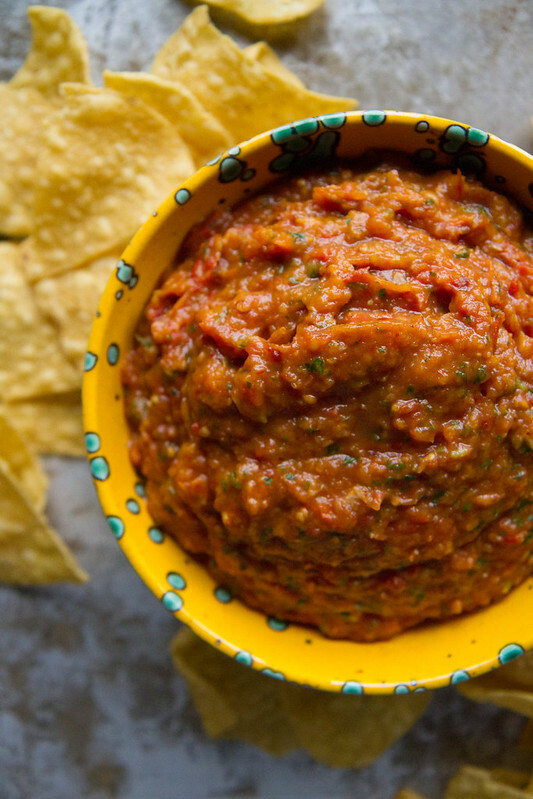 What a beautiful Fall style salsa! Want!! I think you are right, I do need this tonight! This looks amazing. I was wondering if you can omit or replace the cilantro? I think I would just omit it if you hate cilantro, or you could sub flat leaf parsley? I am collecting recipes for attending parties so that I will never again be surrounded by tables of food I can’t eat! I had a lovely weekend of baking and cooking with a dear friend back to the states and everything was just for her. But I ran out of energy to cook for me by the time I was off to the Egg Nog party.